Spring time is filled with plant sales, from Master Gardener chapters to local garden groups. Save the dates for some of these beloved sales, this month through May. The Skagit Conservation District Plant Sale offers a large selection of native plants on Saturday, April 13. Pre-order pick up is Friday, April 12. The sale runs 9 a.m. to 1 p.m. at WACD Lynn Brown Materials Center, 16564 Bradley Road, Bow. For more details, see http://www.skagitcd.org/native_plant_sales. The Growing Veterans Plant Sale will be Saturday and Sunday, April 20-21. This year’s starts were grown with seed donations from Uprising Seeds and Osborne Quality Seeds. Starts include tomatoes (many heirloom and cherry varieties), hot peppers, broccoli, purple cauliflower, onions, basil, lettuce and more. All proceeds from the plant sale help fund Growing Veterans. The sale will be held 10 a.m. to 2 p.m. at BelleWood Acres, 6140 Guide Meridian, Lynden. The Everson Garden Club Plant Sale is Saturday, April 27, from 9 a.m. to 1 p.m. at the Everson Elementary School lawn, 216 Everson Goshen Road, Everson. Find lots of colorful perennials, (unusual as well as the old stand-bys), natives, shrubs and small trees at significantly below retail prices. All plants thrive in Whatcom County. Vendors will offer veggie starts, specialty plants and crafts. Cash or checks only, please. For information, contact Linda Burpee at 360-592-5456. The Snohomish County Master Gardener Foundation Plant Sale will be Saturday, May 4. More than 5,000 tomatoes starts, 4,000 herb and vegetable starts, perennials, native plants, trees, shrubs, ground covers, perennials, and living garden art will be on site. Master gardeners will be available to answer questions. The sale runs 9 a.m. to 2 p.m. at WSU Snohomish County Extension, McCollum Park, 600 128th St. SE, Everett. (425) 357-6010, www.snomgf.org. The Birchwood Garden Club’s 27th Annual Plant Sale will also be held Saturday, May 4, 9 a.m. to noon at the downtown Bellingham Public Library, 210 Central Avenue, lower level. There will be a wide variety of shrubs, trees, roses, perennials, annuals, veggie starts, pots, books and choice selection from members’ gardens. Proceeds from the sale benefit numerous community organizations including the Whatcom Museum and Bellingham Public Library gardens along with donations of gardening literature for both adults and children at the library. Come early for best selection. For more information, see www.birchwoodgardenclub.org. The Native Plant Sale hosted by the Salal Chapter of Washington Native Plant Society will be Saturday, May 4. Trees, shrubs, perennial flowers and more will be available from 10 a.m. to noon at 16650 State Route 536, Mount Vernon. For more information and a plant list email nativegarden@fidalgo.net. 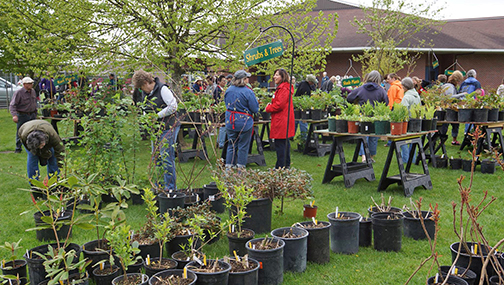 The 28th Annual Whatcom County Master Gardener Plant Sale will be Saturday, May 11, 9 a.m. to 2 p.m. at Hovander Homestead Park, 5299 Nielsen Avenue, Ferndale. One of the largest annual plant sales in Whatcom County, this sale is the day before Mother’s Day. Hundreds of locally grown plants will be available, including more than 20 varieties of unique and heirloom tomatoes, herbs and vegetable starts, flowering and shade plants and shrubs, bonsai, dahlia tubers, succulents and natives. Stop by the table of potted succulents just for Mother’s Day, and visit with local vendors. See the demonstration gardens and check in with Master Gardeners to answer questions. The Master Gardener program offers free workshops, a year round diagnostic plant clinic and more. To learn more about the program, visit http://whatcom.wsu.edu/ch/mg/html. Cascade Cuts Plant Sale: Saturday, May 18. This wholesale perennial, annual, veggie and herb nursery is open to the public one day a year as a fundraiser for Sustainable Connections’ Food & Farming Program. Ornamentals, herbs, flowers and more available for purchase. Check out coffee trees, hops, compost tea machines, and more. 9 a.m. to 4 p.m. 632 Montgomery Road, Bellingham. For more information, contact Erin@sconnect.org. For more upcoming sales, see Grow Northwest’s event calendar at www.grownorthwest.com. Send sale information to editor@grownorthwest.com.